The Yoga Sampler Blog follows our cameras as we photograph New York's top teachers and studios. Step inside New York's yoga community and feel the inspiration! YogaSampler PRO videos pick up where our free Sample videos leave off. They range from 20 to 90 minutes and are specially produced with intimate class formats for at-home viewers. It's a yogi! It's a huge crown chakra! No, it's our new logo! Just in time for the holidays, we've cut you a slice of tasty yoga pie. "Class comes to you." Our interview in YogaCity NYC. We were recently interview about the Yoga Sampler project on New York's leading yoga blog, YogaCity NYC. Click to read the full article. The First Yoga Video and "The Art of Transformation"
Last weekend I headed down to DC for the “Yoga: The Art of Transformation” exhibit . If you haven't heard yet, the Freer | Sackler Museum at the Smithsonian put together a “leitmotif” of two thousand years of yoga art. Our friend and collaborator Yogi J. Brown has written a brutally honest post, "The Unbearable Sweetness of Yoga", about what it's like to put his heart, soul and sum total of his teaching experience into making a yoga video for the first time. We recently had the chance to shoot our friend and yoga teacher Bibi Lorenzetti at The Shala in Fort Greene, Brooklyn. Bibi's classes are a great mix of traditional Ashtanga, vinyasa and her lighthearted personality. As you can tell from the photos, Bibi herself has a beautiful practice, full of her happiness and vitality. Join senior Jivamukti Yoga teacher Jessica Stickler as she hosts a soul soothing, improvisational Live Music Savasana with NY-based musicians Kevin Nathaniel Hylton and Morley. As a summer preview to YogaSampler's upcoming video series, we hit the beaches of Cape Cod with our newest team member, the talented yoga teacher and musician Cypress Dubin. 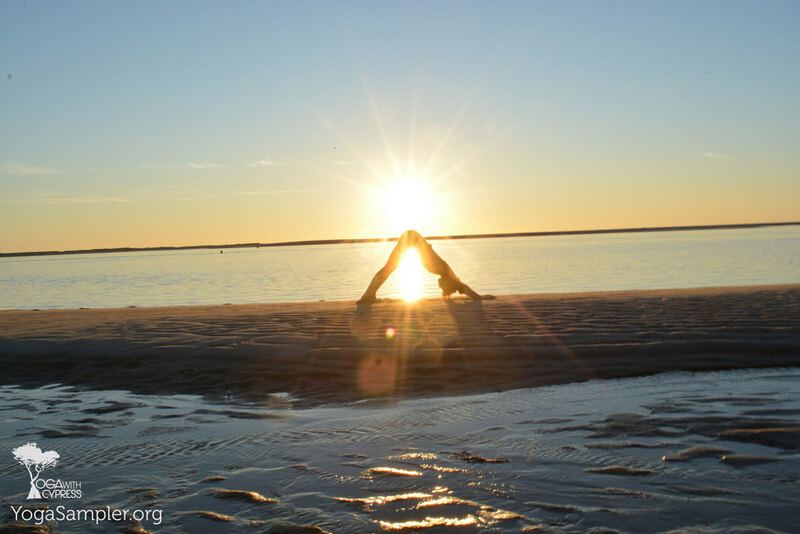 Check out the pics below of Cypress practicing a bit of asana on the peaked dunes and sunset beaches of The Cape. You already know you need a website, virtually all your customers either find or research your yoga business online, and maybe you've tried to build your own or asked a friend or family member or even gotten a quote from a developer, but you're still stuck. Your website either looks crappy, acts crappy or, worse of all, doesn't even exist yet.